Welcome to the first REC-CAP Newsletter. The purpose of this newsletter is to inform you about and bring you updates on the REC-CAP and developments in the recovery capital world. This first issue will introduce you to this exciting and innovative research method and the programme of work around it. Also, this issue will present preliminary findings from one project in particular, the FARR pilot, about which more information can be found below. 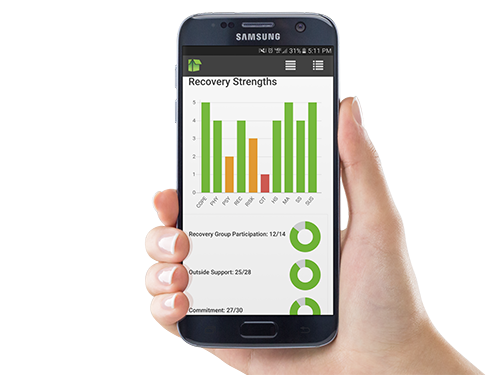 The REC-CAP is an innovative system for mapping the growth of recovery resources and for recovery care planning that has been developed at Sheffield Hallam University in the UK. It is a way of mapping in a systematic and scientific way all of the things that both research and lived experience tell us are critical to making the journey to stable recovery. The original idea comes from sociology and a French academic called Bourdieu who developed the idea of SOCIAL CAPITAL. Social Capital describes those assets that people have irrespective of whether they have financial capital, including things like friendship, status in their community and the knowledge of both how to do things and how to get things in their local communities. In 2000, an American sociologist called Robert Putnam extended this idea to focus on social networks and groups as the basis for community – in other words, social capital was seen as a kind of currency of both community involvement and wellbeing. Around this time, two addiction recovery researchers, Robert Granfield and William Cloud, adapted this to the notion of RECOVERY CAPITAL to refer to all the resources that a person can draw on to support their recovery journey. Although the idea has been cited widely since this initial paper in 1999, most of the work has been conceptual and very few studies have attempted to operationalise the idea. The REC-CAP takes the idea of recovery capital and translates it into something that can actually be measured. This has not happened overnight and there has been a gradual process of research and planning that initially involved the development of a 50-item measure called the ASSESSMENT OF RECOVERY CAPITAL. This is a scale that consists of 10 sub-scales of five items each that are summed up into 25 questions about personal recovery capital and 25 questions about social recovery capital. 1. That other aspects of recovery capital including community engagement should be added to the measure to provide a more comprehensive assessment of resources and capital. 2. That it should form the basis for action – in other words, that as soon as the questionnaire is filled in, a recovery care plan is generated. What does the REC-CAP do? The logic of the REC-CAP is based on what we know about recovery pathways and journeys. First, that recovery relies on STRENGTHS AND ASSETS. Our approach is that long-term sustainable recovery requires the gradual building of personal, social and community recovery capital and that these component parts grow dynamically and iteratively – in other words, that growth in any one of these areas promotes growth in the others. First, the person must overcome those acute harms that prevent wellbeing – illness and disease, continued problematic substance use, offending and its consequences, family disruption, homelessness and experiencing stigma and exclusion. However, overcoming these things is only the preliminary step to starting on a recovery path. The second stage involves the gradual growth of strengths and wellbeing – personal resources and skills, linked to a sense of belonging and hope, identity and purpose both within the immediate social network and more broadly. Our aim is to build a mapping and measurement system that is used to gather standardized data supplemented by personal goals and uses these to review and plan for the next phase of the recovery journey. In the first formal UK evaluation of the REC-CAP, the DLC team have partnered with the Rehabilitation of Addicted Prisoners’ Trust (RAPt) to test the REC-CAP in three prisons in the south of England – HMP The Mount, HMP Brixton and HMP Swaleside. Staff from both prisons and RAPt took part in a full-day training programme in May 2016 to introduce them to a version of the REC-CAP adapted for use in prison. The aim of the pilot was to complete 50 paired interviews – the same prisoners interviewed on two occasions to measure the changes in recovery capital, and to support prison staff to be able to deliver and interpret the REC-CAP. The Mount rolled out the questionnaire with 36 prisoners beginning the RAPt programme in June. Time 2 follow ups were taken from approximately 60% of the cohort. Brixton initiated baseline data collection in the autumn. Swaleside is a new joiner in the project and is organising its baseline phase presently. Analysis of this data is forthcoming. The REC-CAP team have partnered with the Florida Association of Recovery Residences (FARR) and Cashbox Solutions to test and develop the REC-CAP for use in recovery residences and to develop an online version of the instrument that is outlined below. Following two visits by the research team to Florida, eight accredited recovery residences signed up to participate in the first phase of the REC-CAP project. Staff and other interested stakeholders completed a half-day training event and participating residences were asked to select from either a roll-out that involved worker administration of the REC-CAP or distribution for the clients to self-complete. Twenty-one attendees completed a bespoke evaluation designed around the Workshop Evaluation (WEVAL) instrument developed at Texas Christian University. Included with the WEVAL was a staff well-being measure. On 3 domains (psychological health, physical health and quality of life) each with a scale of 0-20, participants’ average scores were 16 for psychological and physical health, and 17 for quality of life (see Figure 2). The group was asked how strongly they felt about a number of statements about their experiences of work, grading their response 1-5, with 1 being disagree strongly and 5 being agree strongly. The highest scoring statements were regarding the sense of importance that they placed on their work. The group reported on average that they strongly agreed with giving high value to the work they did, they were proud of their work and they felt it was important to develop their skills and grow professionally. In comparison, the lowest scoring statements were regarding staff capacity. Statements that participants disagreed with the most included not working well with others, feeling under pressure and that they wanted to find a new job. Participants were then given another set of statements regarding their evaluation of the workshop itself. 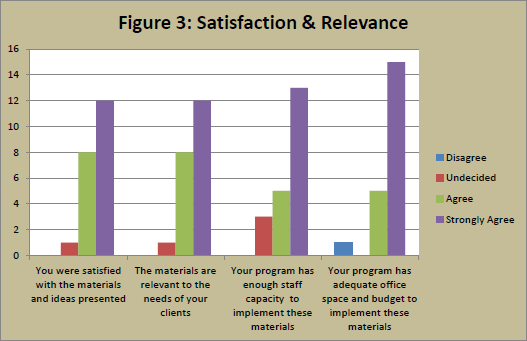 On average, participants strongly agreed that what they had learnt was relevant, the materials provided were useful and they had the capacity to implement them (see Figure 3). Furthermore, participants mutually agreed that they had learnt something new and that they now felt better equipped. There was also a strong consensus that all involved were keen to be part of future developments (see Figure 4). In summary, on average, the group believed that the REC-CAP could work, was practical and would be an asset to their profession. Compared to a target of 300 completions of the form, almost 600 REC-CAPs were successfully completed and returned to the research team, indicating that the instrument was highly acceptable both to the staff and to the residents in the eight services. Overall wellbeing: 544 participants responded to the quality of life and satisfaction questions, which have a scoring range of 0-100. The mean score was 83 (see Figure 5). Barriers to recovery: 546 participants reported on the barriers to recovery, which has a scoring range of 0-5. 75.3%, or 411 people, reported none or 1 barrier; 52.2% (285 people) reported no barriers. The mean score was .8950, and the median was 0. See Figure 6 below. Unmet needs: Fewer participants endorsed unmet needs, with 251 responses in this domain. The scoring range is 0-7. 66.9% of respondents reported none or 1 unmet need, whilst 33.1% reported having 2 or more. The mean score was 1.6932, and the median was 1. See Figure 7 below. Personal recovery capital: 546 participants reported on personal recovery capital, which has a scoring range of 0-25. The mean score was 22 (see Figure 8). Social recovery capital: 546 participants reported on social recovery capital, which has a scoring range of 0-25. The mean score was 22 (see Figure 8). Community recovery capital: 546 participants reported on community recovery capital, which has a scoring range of 0-14. The mean score was 11. Community support: 543 participants reported on community support, which has a scoring range of 0-28. The mean score was 24. Commitment and motivation: 543 participants reported on commitment to sobriety, which has a scoring range of 0-30. 71.3% of respondents scored the maximum on this scale. In summary, across the entire sample, there is strong recovery capital and wellbeing reported although there is considerable variation in wellbeing within the sample; and there are residual barriers to recovery in parts of the population and additional treatment and support needs. The assumption made in this model is that recovery is a process of building strengths over time. But the recovery journey is not linear and the gradual accrual of recovery resources requires the monitoring and management of setbacks related not only to substance use but other key life domains as well. Additionally, the model assumes, as evidenced in the data, that while there are likely to be a series of ongoing support needs from professional services for some people in their recovery journey, it is necessary to monitor whether the support received is sufficient in addressing the barriers to stable recovery. While both barriers and additional needs applied to relatively small sub-samples, they are crucial to flag in developing recovery reviews and planning models. SHU and FARR have contracted the development of a cloud-hosted, online version of the REC-CAP that is available for delivery on any mobile device. Navigators can easily administer the assessment and goal-setting process electronically, delivering visual reports that are meaningful to all stakeholders. The resident, through their own portal, can view assessment results and track goal progress. The REC-CAP data belongs to the resident and travels with them on their journey through the continuum of care and beyond. Assessment results are passed back to both the providers and to Sheffield-Hallam University for ongoing research. The software is currently being used by Phase 2 participants, and will be available to the public on June 1, 2017. For more information, click here. REC-CONNECT, funded by The Health Foundation: This project focuses on building local pathways to community capital, social capital and connectedness to improve well-being outcomes by training community connectors in principles of assertive linkage to connect new-to-recovery service users with community assets. The REC-CAP is being used to measure recovery capital with this cohort. This project is critical in supporting peer connectors to use the REC-CAP in monitoring recovery and particularly in directing peer support for recovery planning based on a systematic and evidence-based model. REC-PATH, a Horizon 2020 funded project: This project is a major European project spanning the UK, Belgium and the Netherlands. 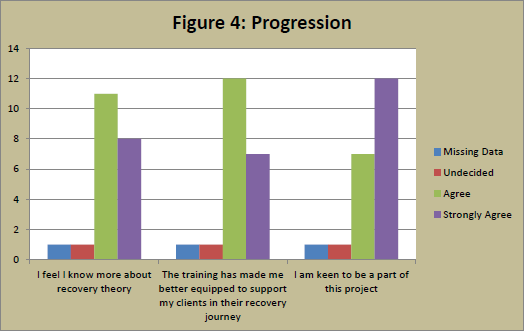 Its aim is to map pathways to recovery in populations engaging with different mechanisms of behaviour change for recovery – mutual aid, peer-based support, residential and community treatment, specialist treatment: maintenance and abstinence oriented) or through their own ‘natural recovery’ endeavours, at different stages of their addiction careers. Again, REC-CAP is the measure of recovery capital for the 450 cohort. This is a critical project in helping us to understand the growth of recovery capital across different recovery pathways and to extend the use of REC-CAP into a range of European settings. 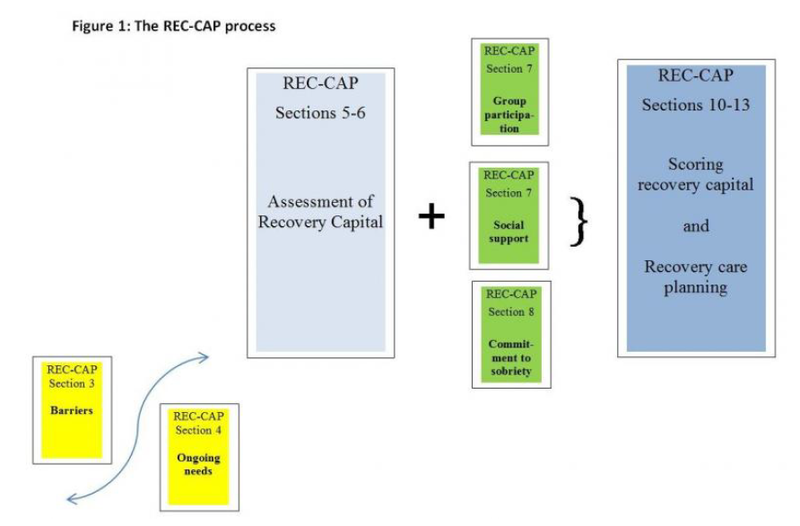 The REC-CAP is also the recovery capital instrument in two recovery programme evaluations, a recently concluded assessment of the Intuitive Recovery programme, and an ongoing evaluation of the Double Impact Recovery Academy programme. Funded by Alcohol Research UK and the Helena Kennedy Centre of International Justice, Beth Collinson, a graduate in criminology from Sheffield Hallam University, has started a PhD examining the role of community connections and social networks in building recovery capital. With a focus on gender differences in pathways to recovery for people with entrenched alcohol problems, we have partnered with Sheffield Alcohol Support Services (SASS) who run the appropriately named Alcohol Recovery Centre (ARC). While SASS have been using the Assessment of Recovery Capital as a core part of their assessment and review for a number of years, the project will use the REC-CAP as part of a project mapping and development model. Beth’s PhD will assess the relationship between growth of recovery capital and engagement with community resources and assets and will assess the extent to which this differs between male and female clients of the service. Apart from assessing gender differences in recovery pathways, the study will have a particular focus on social and community recovery capital and will examine the impact of positive engagement in groups and recovery wellbeing. This programme of research is based in Jobs, Friends and Houses which is a social enterprise run by Lancashire Police in partnership with the recovery community of Blackpool, a seaside town in the north-west of England. Taking people early in recovery and those just out of prison, the project gives people building trade skills while actively engaged in increasing the housing stock of the town and, to some extent, building their own recovery housing. 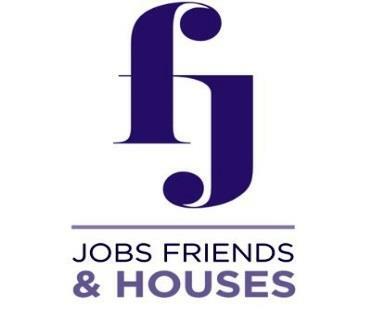 Jobs, Friends and Houses has also developed a very strong community feel as participants work together, sometimes live together and support each other’s recovery. The thesis will focus primarily on the relationships that people form in their recovery and Lauren will map the growth of recovery capital as it links to growth in their ‘zone of trust’ in relationships with peers and with those outside the group. The project will use a version of the REC-CAP as part of a mixed methods research design and will track recovery capital growth over time. The REC-CAP is an exciting development both supporting and resting within a larger body of world-leading research work in the Department of Law and Criminology and the Helena Kennedy Centre for International Justice (HKC) that includes the Life in Recovery surveys, Social Identity Mapping, Asset-Based Community Development, Assertive Linkage and other innovative research methods. The Desistance and Recovery section of the DLC research unit has active research on-going in all of these areas and others. The DLC/HKC hosted the UK Life in Recovery survey in 2015 and continues to work on that major research locally, nationally and globally, expanding its reach into families with the current Family Life in Recovery project. The DLC research portfolio includes partnerships with and funding from The Health Foundation, Alcohol Research UK, Action on Addiction, Forces in Mind Trust and others. Most recently the DLC/HKC was successful in a Horizon 2020 bid with European partners in Belgium and the Netherlands to study recovery pathways and models of behavioural change across the UK, Belgium and Netherlands. SHU is the consortium lead for the €800,000 project, entitled REC-PATH. The REC-CAP will play a prominent role in the REC-PATH project. The DLC/HKC has just recently established a Prisons Research section with research projects joining the work we are doing with RAPt with work establishing family community connectors for soon to be released inmates at HMP Kirkham, establishing a ‘recovery prison’ at HMP Holme House and a mentoring programme for soon to be released and recently released female prisoners in partnership with Key Changes, and a fifth project assessing the implementation and effectiveness of alcohol treatment in prisons in England. HKC’s central values are widening access to justice and education, promotion of human rights, ethics in legal practice, equality and respect for human dignity in overcoming social injustice. The REC-CAP is a part of our commitment to evidencing effective community reintegration of marginalised and vulnerable populations, challenging stigma and exclusion, and enabling people in recovery to fulfil their potential and be active members of their families and communities. The REC-CAP team is led by Sheffield Hallam University (SHU) Professor David Best. Professor Best is a professor in criminology and heads the criminology section of the DLC. He also directs the DLC/HKC research unit. Professor Best is an international authority on recovery capital and has led the development of the REC-CAP from its inception. Other core REC-CAP team members include SHU DLC faculty members Dr. Jamie Irving and Dr. Catrin Andersson. Both Dr. Irving and Dr. Andersson lead research projects utilising REC-CAP and remain involved in its design and development. Finally, SHU DLC faculty member Michael Edwards rounds out the core REC-CAP team, providing overall design, development, implementation and administrative support for the instrument and projects around it. Michael and the team are supported by two research assistants, Ivan Cano and Adam Mama-Rudd. Michael welcomes your enquiries at michael.edwards@shu.ac.uk.